This is a fine twentieth century hymn of praise that has become a favorite with God's people during the last three decades. Its popularity is due in large part to its wide use by favorite gospel singers, notably George Beverly Shea. Although introduced to American audiences when Mr. James Caldwell sang "How Great Thou Art" at Stony Brook Bible Conference on Long Island in 1951, it was not until Cliff Barrows and Bev Shea of the Billy Graham Evangelistic Team used it during the famed London Crusade in Harringay Arena that "How Great Thou Art" started to become universally well-known. The original Swedish text was a poem entitled "O Store Gud." written by a Swedish pastor, the Reverend Carl Boberg, in 1886. In addition to being one of the leading evangelical preachers of his day. Boberg was also the successful editor of the periodical Sanningsvittnet. His inspiration for this text is said to have come from a visit to a beautiful country estate on the southeast coast of Sweden. He was suddenly caught in a midday thunderstorm with awe-inspiring moments of flashing violence, followed by a clear brilliant sun. Soon afterwards he heard the calm, sweet songs of the birds in nearby trees. The experience prompted the pastor to fall to his knees in humble adoration of his mighty God, He penned his exaltation in a nine-stanza poem beginning with the Swedish words "O Store Gud, nar jag den varld beskader." Several years later Boberg was attending a meeting in the Province of Varmland and was surprised to hear the congregation sing his poem to the tune of an old Swedish melody. The subsequent history of this hymn is most interesting. It is thought that soon after Boberg's version, the text was translated into German by Manfred von Glehn and entitled "Wie gross bist Du." Later in 1925 the Reverend E, Gustav Johnson of North Park College. Chicago, Illinois, made the first literal English translation from the Swedish test. This translation is quite different from the text that we know today but may still be found in some hymnals. Johnson's literal translation of the Swedish text is entitled "O Mighty God, When I Behold the Wonder." In 1927 I. S, Prokhanoff came upon the German version and translated it into the Russian language. In 1933 the Reverend S. K. Hine and his wife, English missionaries, were ministering to the people of the Ukraine. It was there they learned the Russian translation of "O Store Gud" from a congregation of Ukrainians. They remember singing it as a duet in dark, unevangelized places and the telling effect it had on the unsaved. The thought of writing original English lyrics to this song did not then occur to them—that was to await their crossing into Sub-Carpathian Russia, where the mountain scenery was to play its part. The thoughts of the first three verses in English were born, line upon line, amid unforgettable experiences in the Carpathian mountains. (The fourth verse was written later in England.) Thus, inspired partially by the Russian words, partially by the awesome wonder at the sight of "all the works thy hand hath made," the thoughts of the first two verses sprang into life in English. As Reverend Hine and his wife continued their evangelizing in the Carpathian mountains and distribution of gospels in village after village, verse three came into being. When war broke out in 1939, it was necessary for Reverend Hine and his wife to return to Britain; now armed with these three verses, the writer continued his gospel campaigns during the "Blitz years." The fourth verse did not come until after the war. The tune for this hymn is an arrangement made of an old Swedish folk melody. It is typically characteristic of many other hymn tunes, i.e., "Day by Day" (No. 17) with its lilting, warm, singable simplicity. 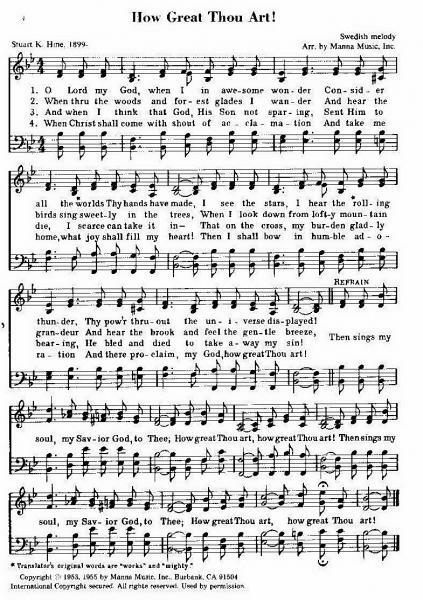 With his original English lyrics and his arrangement of the Swedish folk melody, Mr. Stuart K. Hine published what we know today as the hymn "How Great Thou Art." Assignments of copyrights and publication rights to an American publishing firm in 1954 helped spread the popularity of this hymn. In April of 1974 the Christian Herald magazine, in a poll presented to its readers, named "How Great Thou Art" the No. 1 hymn in America.